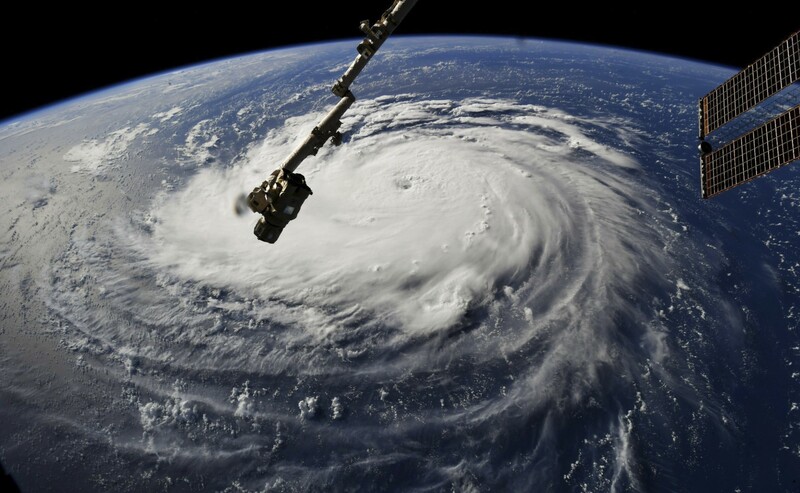 In a photo provided by NASA, Hurricane Florence approaches the east coast of the U.S., Sept. 10, 2018. Evacuations were ordered on coastal islands as the region braced for a destructive storm. South Carolina officials said traffic out of Myrtle Beach and Charleston had climbed to several times its normal level Tuesday morning, as residents and visitors heeded a mandatory evacuation order for coastal areas ahead of Hurricane Florence. The Category 4 storm is expected to make landfall Thursday night, with tropical storm-force winds arriving by Thursday morning. Officials there and in North Carolina and Virginia are imploring residents and visitors alike to leave low-lying coastal areas and islands, and more than 1 million people are expected to flee the storm. Forecasters are warning of record-setting storm surges, along with rains heavy enough to cause catastrophic inland flooding. Some experts worry that the storm could knock out power for days. As of 11 a.m. Tuesday, the center of the storm was in the Atlantic Ocean roughly halfway between Bermuda and Puerto Rico. Mandatory evacuations have been ordered for most coastal counties of South Carolina and in parts of North Carolina. Schools and government offices in coastal counties of both states have been ordered closed. Responding to updated forecasts of the storm’s likely path, McMaster rescinded his evacuation order for the three southernmost coastal counties in South Carolina. Evacuations began at 8 a.m. Tuesday in coastal areas of Virginia, including large parts of the Norfolk and Virginia Beach area. In Maryland, a state of emergency was declared to mobilize resources ahead of the storm. The storm’s maximum sustained winds eased slightly to 130 mph in the morning, but the National Hurricane Center said the storm would probably gain strength later in the day, possibly to become a Category 5 system. Gov. Henry McMaster of South Carolina said that the lanes of two major divided highways — Interstate 26 and U.S. 501 — would be reversed to make them one-way, carrying traffic only away from the coast for the mandatory evacuations starting at noon Tuesday, and that two other routes might also be reversed if needed.